The outstanding beauty of nature and healing thermal springs – these are the reasons why Bled, a health resort, is hugely popular. 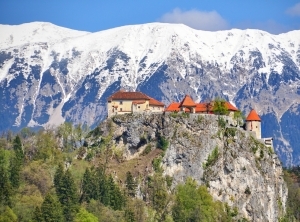 Its main tourist attraction is the Bled Castle. This beautiful building, one of the historic European castles, is situated on the shore of famous Lake Bled. This fortress has been reflected in the lake water for more than a thousand years, towering at the top of the rock, surrounded by the picturesque Julian Alps and a dense forest. Many facilities in the Bled Castle were built in the Baroque style, although the arrangement of buildings during the renovation remained the same as it was in the Middle Ages. In that period buildings were usually arranged around the internal terrace and the Bled Castle was not an exception. The lower terrace is surrounded by utility buildings, while the upper one is surrounded by residential premises that belonged to the upper class. The most notable building of the upper terrace is a chapel dedicated to the bishops of Brixen, Albuin and Ingeuin. This Gothic chapel was erected in the 16th century, unfortunately, following the earthquake in 1690, it had to be renovated. As a result, it became higher and its vault was made in the Baroque style. Then murals were painted also on the north and south wall. They presented King Henry II with his wife Cunigunde. Behind the wall is a historic museum, which houses exhibit items related to the long history of the Bled Castle. One of the most characteristic items is known as the bird-of-paradise, a peacock-shaped brooch dated from the 6th century. This historical adornment was found while carrying out excavation works at Pristavi below the Bled Castle. In the museum halls presenting the history of this castle furnishings characteristic for various historical periods were recreated. The walls of the Bled Castle house a permanent exhibition of the National Museum of Slovenia as well. 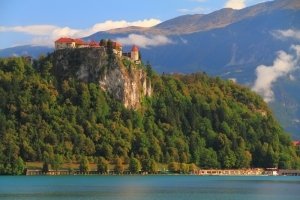 It presents the history of Bled from ancient times until today. The whole exhibition is divided into eight thematic sections and outlines the environment, life, craft, culture, religion and other important aspects of life for the inhabitants of this country. Besides the museum exhibitions, there is also an old-fashioned printing house in the castle, so everyone interested can make a memorable souvenir – a commemorative certificate printed on your own, using a recreated Gutenberg printing press. Tourists can try their hand in the old art of smithery and prepare for themselves a commemorative coin in the castle smithy located on the upper courtyard. And after the hard work and taking an interesting but exhausting trip around the castle, everybody interested can visit a wine cellar to crown their visit in the Bled Castle, tasting excellent Slovenian wine.